At the April 14 President’s Recognition Reception, ASU President Michael M. Crow awarded university movers and shakers with the President’s Award for Innovation, the President’s Award for Sustainability and the President’s Medal for Social Embeddedness, as well as the SUN Awards for Individual Excellence. Recipients of the President’s Award for Sustainability included the Seville Orange Juicing Partnership, a venture among ASU Facilities Management Grounds Services, Aramark, Campus Harvest and local Sun Orchard Juicery. 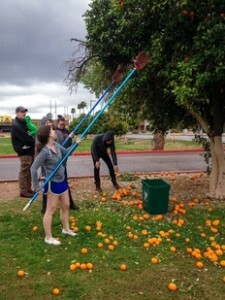 This past year, volunteers and Facilities Management Grounds staff harvested 10,000 pounds of Seville oranges from the Tempe campus, and Sun Orchard processed and bottled 380 gallons of juice. Aramark then purchases the juice for their chefs to use in residence halls, restaurants and at catered events. Even the orange peel is processed and used by local farmers as a healthy, all-natural feed for cattle and hogs. The Clinton Global Initiatives' University Zero Waste and Biodesign's Sustainability Science Education Project also received the President’s Award for Sustainability.